This is something a bit different for me today. 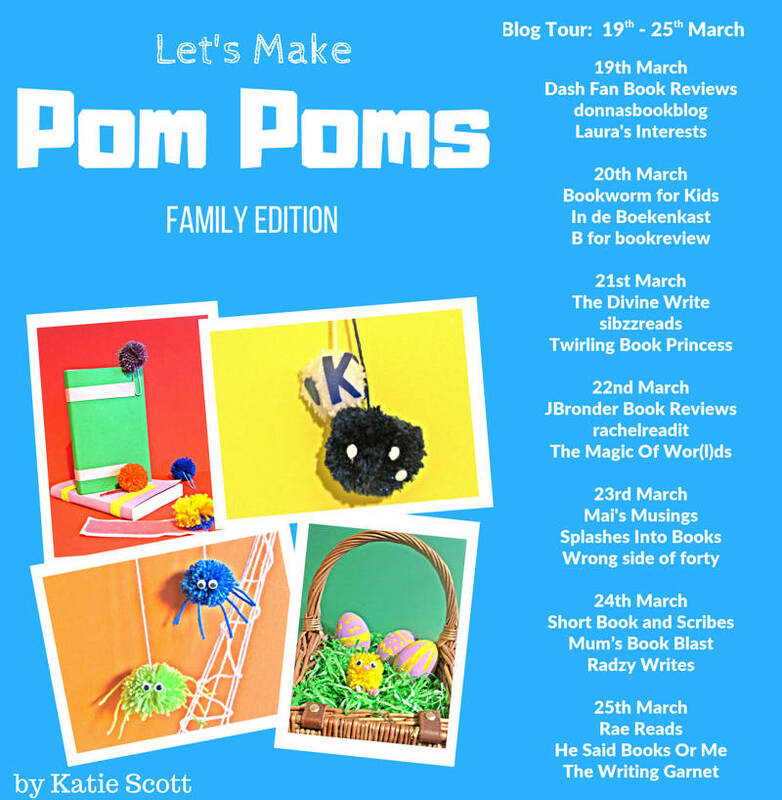 I don’t think I’ve featured a craft book on my blog before so I’m really pleased to be reviewing Let’s Make Pom Poms by Katie Scott today. My thanks for Rachel Gilbey from Rachel’s Random Resources for the place on the tour and for sending me a copy of the book for review purposes. Pom poms make me think of my childhood. I’m sure I remember making them at home and at school. Back then it was with circular pieces of cardboard but apparently you can get plastic pom pom makers now – who knew! There are lots of ideas in the book. You can make penguins, spiders, a butterfly, sushi, a snowman, fluffy dice and lots more. I liked the fact that there were seasonal projects for Christmas and Easter. The instructions are clear and precise and the illustrations are colourful and fun. It’s an eye-catching book. As I was going through the book I was gearing up to say that there were no instructions to make the basic pom pom but then I found them after all the individual projects had been detailed. I thought they might have been at the beginning but I guess that the point is to highlight what you can do with pom poms. Anyway, rest assured, they are there so if you don’t know how to make a basic pom pom then don’t worry. 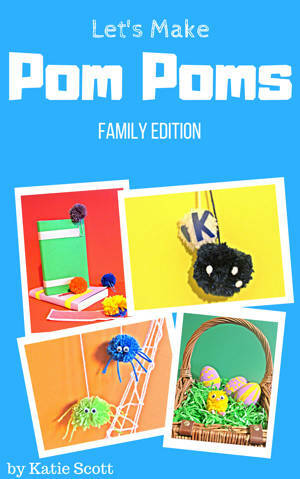 It does focus on using the pom pom makers that you can buy but there are other ways too. Overall, this is a book that adults and children alike can have fun with. And when you’ve made all the designs in the book then the world is your oyster, you can go on to make anything (as long as it’s pom pom shaped!) and the nice thing about it is that these projects are pretty straightforward. Find more work from Katie Scott on her blog.